Sponsorship Summit - tips and strategies to help you peak! Name: Sponsorship Summit - tips and strategies to help you peak! Join us for a full day of creativity, learning and tangible takeaways that will help you grow lasting sponsorship relations. 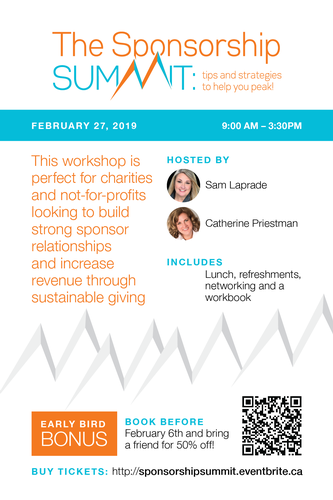 This workshop is perfect for charities and not-for-profits looking to build strong sponsor relationships and increase revenue through sustainable giving. The event will be hosted in a funky, bright venue with lots of opportunity for interaction. Your ticket includes a full day of presentations, exercises and networking along with lunch, refreshments and a workbook to keep. PLUS: Express Sessions on: Cannabis & Fundraising, How to Weave a Story, Elevating Your Organization without Seeming Fiscally Irresponsible, Cost Effective Tools for Outreach... and much more! Book before February 6th and bring a friend for 50% off! Seating is limited to only 60 people to allow for quality interaction and personal responses. Book your seats today and take advantage of the Early Bird Special so your organization can benefit from more than one person attending. Click here to view ticket options.